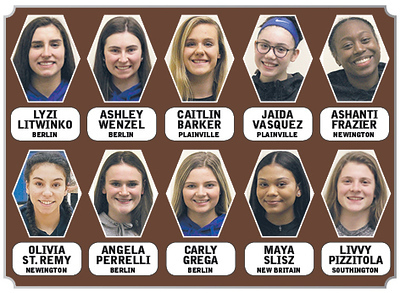 The girls basketball season provided historic individual performances and deep state tournament runs by players and teams in the area, making the 2018-19 All-Herald Girls Basketball Team tough to narrow down to just 10 players. This All-Herald group features some of the best players in the state, including some that have either already committed or are being recruited to play at the collegiate level, thanks to stellar 2018-19 seasons for their respective teams. Berlin was the team to make the deepest tournament run in 2019, as the Redcoats reached the Class M state semifinals behind a pair of prominent scorers in junior Lyzi Litwinko and sophomore Ashley Wenzel. Litwinko, making her third All-Herald appearance, earned all-CCC honors for the third straight season after averaging 14.9 points and 9.7 rebounds per game. Litwinko is an exceptional point guard who was never afraid to crash the glass for Berlin, as she broke the school record for rebounds in a season with 250. Litwinko also made personal history when she netted her 1,000th career point in the state quarterfinals. Litwinko’s stellar season earned her All-State honors and interest from multiple Division I schools, with still a full season to add to her already stacked high school resume. One of Litwinko’s favorite teammates to find on the floor was Wenzel, who was a scoring machine herself during Berlin’s memorable season. Wenzel rewrote the team history books by setting five school records in her sophomore campaign. Wenzel averaged 17 points per game, scored a season-high 32 points against Platt and finished the year with 443 total points, all school records. Wenzel also showed an innate ability to get to the foul line, as her total free throws made (120) and attempted (175) were both program records. Wenzel didn’t just fill the scoring column, she did it with remarkable efficiency, leading a high-scoring Redcoats team in field goal and free throw percentage en route to her second all-CCC and All-Herald selections. She also provided fireworks in the second round of the state tournament, putting home a go-ahead layup with 1.5 seconds left to take down Jonathan Law and keep Berlin’s season alive. Now sitting at just over 700 career points, look for Wenzel to make more history as a junior next season. Senior Caitlin Barker is already a member of Plainville’s 1,000-point club, after reaching the monumental mark earlier this season. She earns her third All-Herald selection after a stellar final campaign as a Blue Devil. Barker finished her illustrious career with 1,159 career points after averaging 22 points per game in 2018-19, and dropped 20 behind four 3-pointers in the final game of her career in Plainville’s state tournament opener against Berlin. Barker earned All-State honors in 2019 as well as her third selection to the all-CCC team while continuing her great work in the classroom, where she is a member of three National Honors Societies. Her high school career is over, but her basketball career will continue at Emmanuel College next winter. Barker’s scoring benefited from having a great point guard in sophomore Jaida Vasquez, who makes her first All-Herald appearance after finishing second in scoring for Plainville, trailing only Barker. Vasquez did everything for head coach Jessica Neuweiler this season, leading the team in rebounds, steals and blocks. Vasquez’s efforts landed her on the all-CCC team, where she will almost certainly be listed again next year should she continue her current trajectory. Another exceptional point guard in the area came from Newington, where junior Ashanti Frazier continued her great career with her third All-Herald selection and third all-CCC honors. Frazier averaged 14.4 points and five steals per game, making her a force on both ends of the floor. Frazier helped the Indians reach the CCC Tournament final thanks to a career-high 30 points against Berlin, then helped the program earn its first state tournament win in nine years after tying the game with a 3-point play with just 26 seconds remaining against Shelton. Frazier now sits at 865 career points, and will likely earn career point number 1,000 as a senior next year. Frazier’s teammate Olivia St. Remy leads off the All-Herald Second-Team, as the rebounding machine earns her way onto the group thanks to her ability to eliminate second chances for opponents. St. Remy may not have lit up the scoring column, but averaged 10 rebounds per game while also blocking 25 shots on the year. One of St. Remy’s most memorable performances of the season came in Newington’s first game of the CCC Tournament, where the senior scored 11 points and pulled down 20 rebounds to help the Indians shut down Farmington. As it did on the first-team, Berlin has a pair of entries on our second-team, as senior Angela Perrelli and sophomore Carly Grega both helped complete one of the most balanced offenses in the area. Perrelli, who kept Berlin in the game in the state tournament semifinals with 15 points behind three 3-pointers in the first quarter, played a pivotal leadership role for Berlin as the only starting senior on the team. Perrelli also leads the way in the classroom, earning All-Academic honors while balancing a demanding athletic schedule that also includes time on the school’s soccer and lacrosse teams. Grega also plays on all three teams with Perrelli, and the sophomore enjoyed a breakout season on the hardwood, scoring 246 points this season and finishing second on the team in made 3-pointers. She knocked down two triples in the Redcoats’ 59-46 win over Wethersfield in the first round of the CCC Tournament en route to a 14-point night, which tied for the team lead. She will be asked to provide more of that next season with the exit of Perrelli. Another sophomore that enjoyed a productive season was Maya Slisz of New Britain. While the Hurricanes finished with just five wins on the year, Slisz kept the team in a number of games, including a 10-point performance in a loss to Berlin back in January. Sandwiched around that performance against the Redcoats were a 17-point night against Southington and a 13-point evening against South Windsor, which helped New Britain to a thrilling 56-53 win. Slisz ended the year averaging nine points per game, while providing a defensive spark with four steals per game. She was named to the CCC All-Academic Team for the second year in a row. A third sophomore rounds out the second-team, with Southington guard Livvy Pizzitola earning the honor for the first time. Like Slisz, Pizzitola was one of the stingiest defenders in the area, which the Blue Knights recognized by awarding her the school’s Defensive Player of the Year Award for basketball. Southington fell short of a state tournament berth, but will look to rebound next year with Pizzitola leading a young group with another year of experience on its resume. In the meantime, Pizzitola will perform for the school in track and field, where she has competed at the conference and state level. Posted in New Britain Herald, Berlin, Goodwin Tech, Innovation, New Britain, Newington, Plainville, Southington on Friday, 5 April 2019 20:55. Updated: Friday, 5 April 2019 20:57.